Most days I hear bird sounds in the background throughout the day. There is an automatic cataloging of the ones I know — “Blue jay… Carolina wren…hummingbird… can’t remember that one but I know I hear it all the time…cardinal…” I rest assured that when I have time for “official” birding, they will be around for me to observe, so I can safely ignore them for the moment. But sometimes a bird sound registers as “UNUSUAL” and I know I better go check it out right now. Yesterday I heard a loud chatter coming from the pond area. I recognized it as a Belted Kingfisher, and was able to see it swoop low across the water and then catch a fish. There has been a Ringed Kingfisher about an hour south of here, far outside its usual range, so I took a lot of pictures of this one on the off chance that the Ringed had traveled even further north. But no, this is an ordinary Belted. Not long afterward, I heard a variety of small birds protesting noisily in one spot. I always go check that out in case they are after a snake or a hawk. 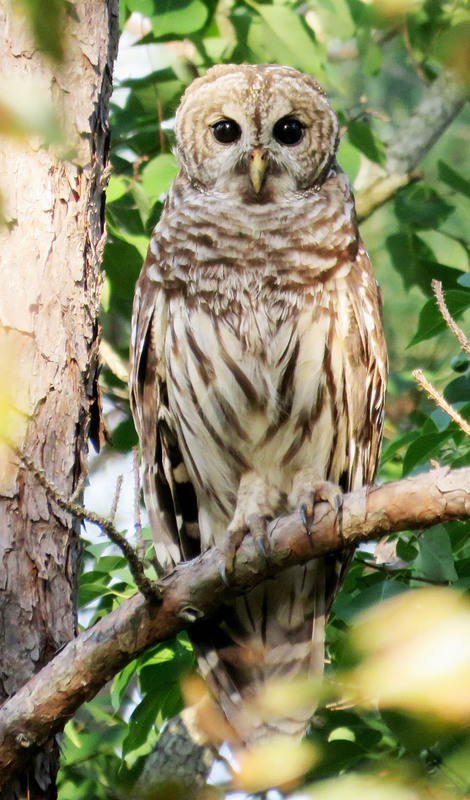 As I was trying to locate them, I saw this beautiful Barred Owl looking right at me. I never did see the mixed group of small birds who were squawking, but the owl stayed long enough for me to get some great pictures, and then it flew off. I hear these owls sometimes, but the only other time I have seen one (in the daylight at least) was almost exactly two years ago, September 18, 2014. 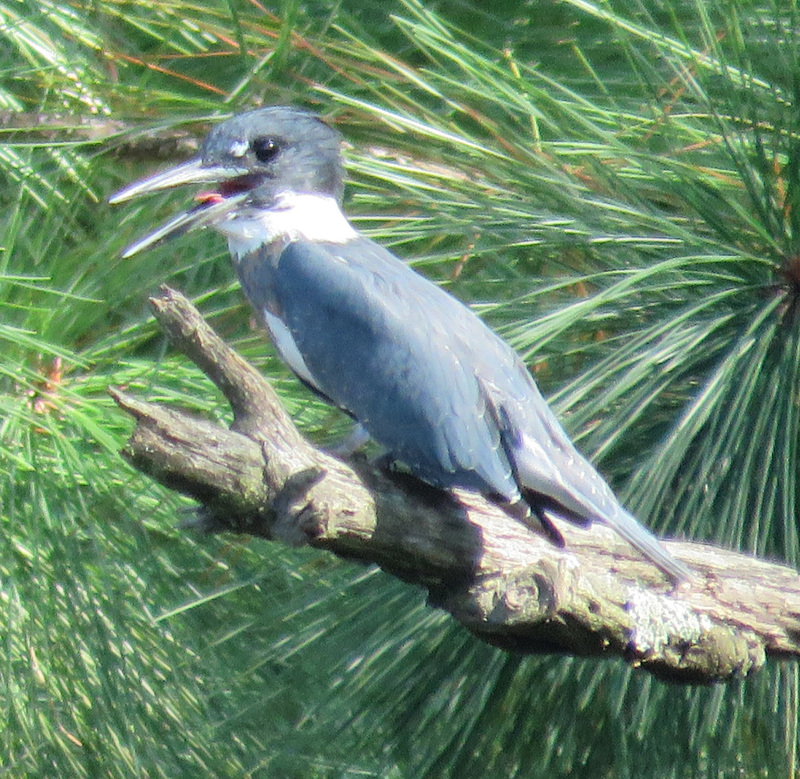 At dusk I was working in the yard, and I heard a loud croak, like I sometimes hear from Great Blue Herons. I turned to see what looked like a large white egret or heron flying in to land in the pond, and two other birds were with it. One looked like a smaller white egret and the other looked like it was half the size of the first bird, but light blue or gray. They all landed in trees around the pond, but they shifted from tree to tree and ended up in a tall bush. As it got darker, I could barely see them, but I could see that the smallest one flapped really awkwardly as it followed the larger white ones. It really looked like a family group, but I have no idea what these were! And they were gone at daylight, so I couldn’t get a better look. Still, at least I got to watch them flying in and finding a perch. If the first bird hadn’t made the croak, I probably would have missed them entirely. 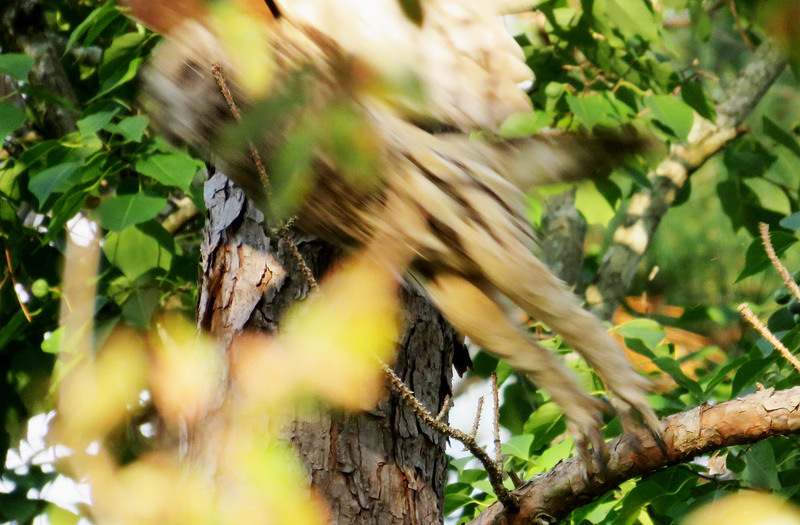 Terrific owl pictures, especially the take-off. Thank you! I was so glad to be so close to that owl! The other time I saw one, I had to really chase it through the woods and then take the picture from very far away. And I always love to see how birds look so different than my mental images of them when they are taking off or flying. Amazing photos! Lucky you to be in the right place at the right time! Love, love, love the owl photos! 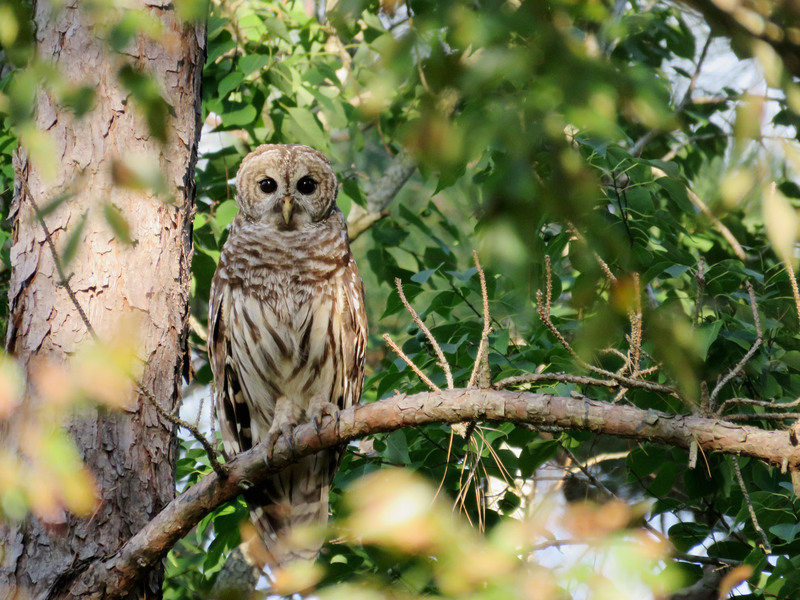 We had a barred owl close and low one day, a few years ago. Still seems like a tremendous treat that we were able to see it. Lucky you! Great photos! I love the owl! I’ve never seen an owl around here, but my husband saw one fly across the road.